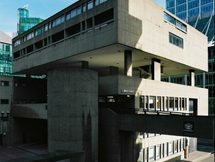 Goldfinger's design is based on his earlier and slightly smaller Balfron Tower (in Poplar, east London), and is in effect a sister building. It is also similar to Anniesland Court in Glasgow, design by J Holmes & Partners and completed in 1968. It has a long, thin profile, with a separate lift and service tower linked at every third storey to the access corridors in the main building; flats above and below the corridor levels have internal stairs. The building contains 217 flats and was originally entirely owned by the GLC with the flats rented as council flats. Shortly after its completion the building was transferred to the local council (the Royal Borough of Kensington and Chelsea). Most of the flats are still social housing, but a significant minority are now privately owned. The tower was completed at a time when high-rise tower blocks were going out of fashion as local authorities were beginning to realise the social problems they caused. By the late 1970s Trellick Tower had a very poor reputation for crime and anti-social behaviour, and many tenants resisted a transfer there. However, with the introduction of the 'right to buy' council homes, many of the flats were bought by the tenants. On 8 October 1984 a new residents' association was formed. As a result of pressure from the occupants, several security improvements including a door entry intercom system and the employment of a concierge were undertaken from the mid-1980s. Property prices rose and flats in the tower came to be regarded as highly desirable residences by some people, despite the slightly gritty edge which remains. Private properties inside the tower now (Sept 2007) sell for between £250,000 for a one-bedroom flat to £480,000 for three-bedrooms, whilst the tower itself has become something of a local cult landmark and was awarded a Grade II listing in 1998. In December 1989, four low power television relay transmitters with aerials were added to the existing communications equipment on the top of the lift tower. This was to solve reception problems for some residents of adjacent districts, including Notting Hill and Westbourne Grove. The transmitter installation is referred to by the BBC and Ofcom as "Kensal Town". The projection at the top of the services tower is the plant room. 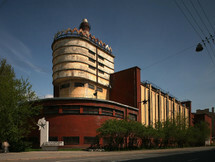 The majority of the plant is located at the top of the tower. The grouping together of the boiler and hot water storage tanks reduces the need for pumps and reduces the amount of pipework needed. Shorter pipe runs also reduce heat loss. The oil fired boilers originally used became obsolete due to the 1973 oil crisis, the year after the tower opened. The flats now have electric heaters and the plant room lies practically empty. A planning application was made to convert it into a penthouse apartment but was refused by the local council.